Malnutrition is directly responsible for 300,000 deaths per year in children younger than 5 years in developing countries and contributes indirectly to more than half of all deaths in children worldwide. In addition, it increases health care costs. See the image below. This infant presented with symptoms indicative of Kwashiorkor, a dietary protein deficiency. Note the angular stomatitis indicative of an accompanying Vitamin B deficiency as well. Image courtesy of the Centers for Disease Control and Prevention. See 23 Hidden Clues to Diagnosing Nutritional Deficiencies, a Critical Images slideshow, to help identify clues to conditions associated with malnutrition. Stool specimens should be obtained if the child has a history of abnormal stools or stooling patterns or if the family uses an unreliable or questionable source of water. The most helpful laboratory tests for assessing malnutrition in a child are hematologic and protein status studies. Hematologic studies should include a complete blood count with red blood cell indices and a peripheral smear. Other studies may focus on thyroid functions or sweat chloride tests, particularly if height velocity is abnormal. In moderate to severe cases of malnutrition, enteral supplementation via tube feedings may be necessary. The prevention of malnutrition in children starts with an emphasis on prenatal nutrition and good prenatal care. Promotion of breastfeeding is particularly crucial in developing countries where safe alternatives to human milk are unavailable. Health care providers should also counsel parents on the appropriate introduction of nutritious supplemental foods. Kwashiorkor and marasmus are 2 forms of PEM that have been described but there has been a paradigm shift in diagnosing pediatric malnutrition. The new schema for defining malnutrition incorporates the concepts of chronicity, etiology, and pathogenesis of malnutrition; its relationship with inflammation; and its impact on functional outcomes. 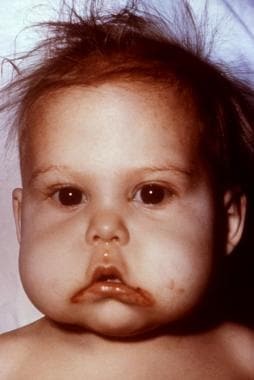 The distinction between the 2 forms of PEM is based on the presence of edema (kwashiorkor) or absence of edema (marasmus). Marasmus involves inadequate intake of protein and calories, whereas a child with kwashiorkor has fair-to-normal calorie intake with inadequate protein intake. Although significant clinical differences between kwashiorkor and marasmus are noted, some studies suggest that marasmus represents an adaptation to starvation whereas kwashiorkor represents a dysadaptation to starvation. See the image below. In addition to PEM, children may be affected by micronutrient deficiencies, which also have a detrimental effect on growth and development. The most common and clinically significant micronutrient deficiencies in children and childbearing women throughout the world include deficiencies of iron, iodine, zinc, and vitamin A and are estimated to affect as many as two billion people. Although fortification programs have helped diminish deficiencies of iodine and vitamin A in individuals in the United States, these deficiencies remain a significant cause of morbidity in developing countries, whereas deficiencies of vitamin C, B, and D have improved in recent years. Micronutrient deficiencies and protein and calorie deficiencies must be addressed for optimal growth and development to be attained in these individuals. Malnutrition affects virtually every organ system. Dietary protein is needed to provide amino acids for synthesis of body proteins and other compounds that have various functional roles. Energy is essential for all biochemical and physiologic functions in the body. Furthermore, micronutrients are essential in many metabolic functions in the body as components and cofactors in enzymatic processes. In addition to the impairment of physical growth and of cognitive and other physiologic functions, immune response changes occur early in the course of significant malnutrition in a child. These immune response changes correlate with poor outcomes and mimic the changes observed in children with acquired immune deficiency syndrome (AIDS). Loss of delayed hypersensitivity, fewer T lymphocytes, impaired lymphocyte response, impaired phagocytosis secondary to decreased complement and certain cytokines, and decreased secretory immunoglobulin A (IgA) are some changes that may occur. These immune changes predispose children to severe and chronic infections, most commonly, infectious diarrhea, which further compromises nutrition causing anorexia, decreased nutrient absorption, increased metabolic needs, and direct nutrient losses. Other pathologic changes include fatty degeneration of the liver and heart, atrophy of the small bowel, and decreased intravascular volume leading to secondary hyperaldosteronism. 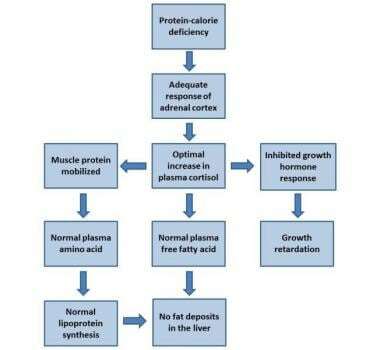 Hormonal adaptation to the stress of malnutrition: The evolution of marasmus. Fewer than 1% of all children in the United States have chronic malnutrition. Incidence of malnutrition is less than 10%, even in the highest risk group (children in shelters for the homeless). Some studies indicate that poor growth secondary to inadequate nutrition occurs in as many as 10% of children in rural areas. Studies of hospitalized children suggest that as many as one fourth of patients had some form of acute PEM and 27% had chronic PEM. The World Health Organization estimates that by the year 2015, the prevalence of malnutrition will have decreased to 17.6% globally, with 113.4 million children younger than 5 years affected as measured by low weight for age. The overwhelming majority of these children, 112.8 million, will live in developing countries with 70% of these children in Asia, particularly the southcentral region, and 26% in Africa. An additional 165 million (29.0%) children will have stunted length/height secondary to poor nutrition. Malnutrition is directly responsible for 300,000 deaths per year in children younger than 5 years in developing countries and contributes indirectly to more than half the deaths in childhood worldwide. The adverse effects of malnutrition include physical and developmental manifestations. Poor weight gain and slowing of linear growth occur. Impairment of immunologic functions in these children mimics those observed in children with AIDS, predisposing them to opportunistic and other typical childhood infections. Children are most vulnerable to the effects of malnutrition in infancy and early childhood. Premature infants have special nutritional needs that are not met with traditional feeding recommendations; they require fortified human milk or specially designed preterm formula until later in infancy. Children are susceptible to malnutrition for differing reasons. During adolescence, self-imposed dietary restrictions contribute to the incidence of nutritional deficiencies. Mehta NM, Corkins MR, Lyman B, Malone A, Goday PS, Carney LN, et al. Defining pediatric malnutrition: a paradigm shift toward etiology-related definitions. JPEN J Parenter Enteral Nutr. 2013 Jul. 37 (4):460-81. [Medline]. Balint JP. Physical findings in nutritional deficiencies. Pediatr Clin North Am. 1998 Feb. 45(1):245-60. [Medline]. WHO. Malnutrition-The Global Picture. World Health Organization. Available at http://www.who.int/home-page/. Blossner, Monika, de Onis, Mercedes. Malnutrition: quantifying the health impact atnational and local levels. 2005. Available at http://whqlibdoc.who.int/publications/2005/9241591870.pdf. Detsky AS, McLaughlin JR, Baker JP, Johnston N, Whittaker S, Mendelson RA, et al. What is subjective global assessment of nutritional status?. JPEN J Parenter Enteral Nutr. 1987 Jan-Feb. 11 (1):8-13. [Medline]. Corkins MR. Why Is Diagnosing Pediatric Malnutrition Important?. Nutr Clin Pract. 2017 Feb. 32 (1):15-18. [Medline]. Benitez-Bribiesca L, De la Rosa-Alvarez I, Mansilla-Olivares A. Dendritic spine pathology in infants with severe protein-calorie malnutrition. Pediatrics. 1999 Aug. 104(2):e21. [Medline]. Mendez MA, Adair LS. Severity and timing of stunting in the first two years of life affect performance on cognitive tests in late childhood. J Nutr. 1999 Aug. 129(8):1555-62. [Medline]. Heywood AH, Marshall T, Heywood PF. Motor development and nutritional status of young children in Madang, Papua New Guinea. P N G Med J. 1991 Jun. 34(2):109-16. [Medline]. Martorell R, Rivera J, Kaplowitz H, Pollitt E. Long-term consequences of growth retardation during early childhood. Hernandez M, Argente J. Human growth:basic and clinical aspects. Amsterdam: Elsevier Science Publishers; 1992. 143-149. Heyman MB, Abrams SA, SECTION ON GASTROENTEROLOGY, HEPATOLOGY, AND NUTRITION., COMMITTEE ON NUTRITION. Fruit Juice in Infants, Children, and Adolescents: Current Recommendations. Pediatrics. 2017 May 22. [Medline]. De-Regil LM, Suchdev PS, Vist GE, Walleser S, Peña-Rosas JP. Home fortification of foods with multiple micronutrient powders for health and nutrition in children under two years of age. Cochrane Database Syst Rev. 2011 Sep 7. 9:CD008959. [Medline]. Stobaugh HC, Ryan KN, Kennedy JA, Grise JB, Crocker AH, Thakwalakwa C, et al. Including whey protein and whey permeate in ready-to-use supplementary food improves recovery rates in children with moderate acute malnutrition: a randomized, double-blind clinical trial. Am J Clin Nutr. 2016 Mar. 103 (3):926-33. [Medline]. US Department of Health and Human Services, US Department of Agriculture. Dietary guidelines for Americans, 2015-2020. US Department of Health and Human Services. 2015. Zeng L, Dibley MJ, Cheng Y, et al. Impact of micronutrient supplementation during pregnancy on birth weight, duration of gestation, and perinatal mortality in rural western China: double blind cluster randomised controlled trial. BMJ. 2008 Nov 7. 337:a2001. [Medline]. Roberfroid D, Huybregts L, Lanou H, et al. Effects of maternal multiple micronutrient supplementation on fetal growth: a double-blind randomized controlled trial in rural Burkina Faso. Am J Clin Nutr. 2008 Nov. 88(5):1330-40. [Medline]. Lazzerini M, Ronfani L. Oral zinc for treating diarrhoea in children. Cochrane Database Syst Rev. 2008 Jul 16. CD005436. [Medline]. Scrimgeour AG, Lukaski HC. Zinc and diarrheal disease: current status and future perspectives. Curr Opin Clin Nutr Metab Care. 2008 Nov. 11(6):711-7. [Medline]. Barber J. Antibiotics Help in Malnutrition Treatment in Children. Medscape Medical News. Jan 30 2013. Available at http://www.medscape.com/viewarticle/778491. Accessed: February 5, 2013. Blecker U, Mehta DI, Davis R, et al. Nutritional problems in patients who have chronic disease. Pediatr Rev. 2000 Jan. 21(1):29-32. [Medline]. Caulfield LE, de Onis M, Blossner M. Undernutrition as an underlying cause of child deaths associated with diarrhea, pneumonia, malaria, and measles. Am J Clin Nutr. 2004 Jul. 80(1):193-8. [Medline]. Chandra RK. 1990 McCollum Award lecture. Nutrition and immunity: lessons from the past and new insights into the future. Am J Clin Nutr. 1991 May. 53(5):1087-101. [Medline]. de Onis M, Blossner M, Borghi E. Estimates of global prevalence of childhood underweight in 1990 and 2015. JAMA. 2004 Jun 2. 291(21):2600-6. [Medline]. de Onis M, Frongillo EA, Blossner M. Is malnutrition declining? An analysis of changes in levels of child malnutrition since 1980. Bull World Health Organ. 2000. 78(10):1222-33. [Medline]. Hay WW Jr, Lucas A, Heird WC, et al. Workshop summary: nutrition of the extremely low birth weight infant. Pediatrics. 1999 Dec. 104(6):1360-8. [Medline]. Islam S, Abely M, Alam NH, et al. 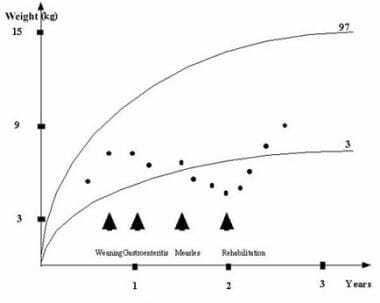 Water and electrolyte salvage in an animal model of dehydration and malnutrition. J Pediatr Gastroenterol Nutr. 2004 Jan. 38(1):27-33. [Medline]. Kleinman RE, Murphy JM, Little M, et al. Hunger in children in the United States: potential behavioral and emotional correlates. Pediatrics. 1998 Jan. 101(1):E3. [Medline]. Kleinmann R, Committee on Nutrition. Pediatric Nutrition Handbook. 4th ed. American Academy of Pediatrics; 1998. Koerner CB, Hays TL. Food allergy: current knowledge and future directions. Immunol Allergy Clin North Am. 1999. 19. Man WD, Weber M, Palmer A, Schneider G, Wadda R, Jaffar S. Nutritional status of children admitted to hospital with different diseases and its relationship to outcome in The Gambia, West Africa. Trop Med Int Health. 1998 Aug. 3(8):678-86. [Medline]. Muller O, Krawinkel M. Malnutrition and health in developing countries. CMAJ. 2005 Aug 2. 173(3):279-86. [Medline]. Rosenfield RL. Essentials of growth diagnosis. Endocrinol Metab Clin North Am. 1996 Sep. 25(3):743-58. [Medline]. Trehan I, Goldbach HS, LaGrone LN, Meuli GJ, Wang RJ, Maleta KM, et al. Antibiotics as part of the management of severe acute malnutrition. N Engl J Med. 2013 Jan 31. 368(5):425-35. [Medline]. This infant presented with symptoms indicative of a dietary protein deficiency, including edema and ridging of the toenails. Image courtesy of the Centers for Disease Control and Prevention.